Another solid day of gains for the spot gold price which ended the gold trading session as a wide spread up candle which broke through the $1220 per ounce price point and briefly touched the $1227.17 price below closing the session marginally lower. The recent bullish sentiment has continued in this morning’s gold trading session with the spot gold price continuing to trade higher at $1226.75 at time of writing. 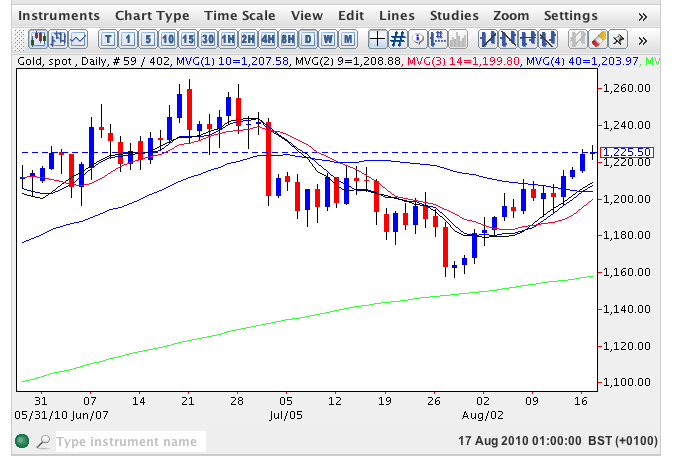 With the 9 day moving average now crossing above the 40 day moving average and with the 14 day moving average about to follow suit this bullish sentiment is now becoming increasingly established and as such we can expect to see a continuation higher of the spot gold price over the next few days, followed by an initial test of $1262.38 and thereafter $1265.05 from which the gold price should break out into new high ground. To the downside of the current price action the 200 day moving average continues to provide an excellent platform of support to the longer trend higher.